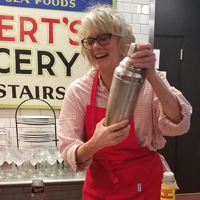 Join Keli and crew for art and cooking classes and special events. Get some fresh ideas for spring entertaining in this tasty class. The menu will include Strawberry Caprese with Almond Pesto, Flank Steak Sandwiches made with homemade Focaccia Bread, Asparagus Tart, Cherry Tomato Goat Cheese Clafoutis, and a Boozy Limoncello Strawberry Shake with Lemon Shortbread. Each course will be paired with a seasonal cocktail. Class includes: Food, cocktails, and recipes.